I installed a special bin to collect cans for homeless recyclers. McClatchy park, an old Sacramento park, reopened in October with some fresh new additions. A $2.8 million dollar renovation added a playground, picnic area, basketball court, jogging track, tennis court and skate park. These improvements could help keep kids and families using the park, and help keep drugs and gang activity away. The skate park was being used as soon as the cement hardened. It was a hit! Unfortunately, it came with a blight I had never considered: Piles of empty beer cans. My friends Ryan and Amy noticed that skaters weren't using the garbage cans, preferring to dump their empties onto the green lawn. When confronted, the reply from the skaters was that the piles of beer cans were "for the homeless", and that putting them in the garbage can would just mix them with discarded filth, where homeless men and women would have a grim task retrieving them. This struck me. 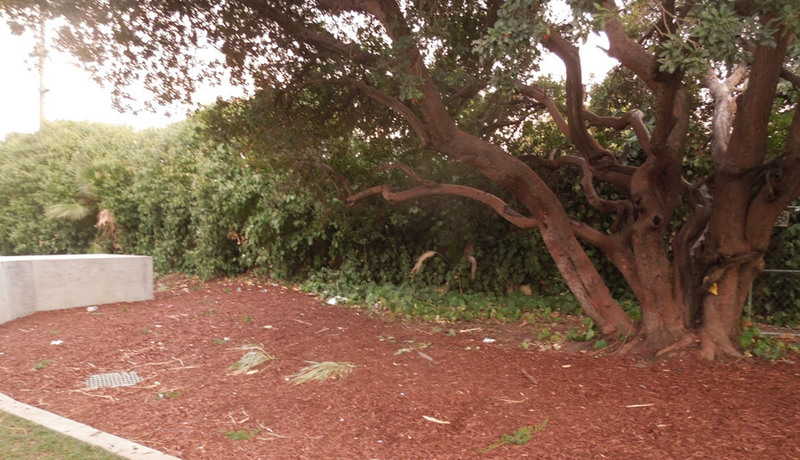 This park facelift already had an ugly pockmark, but it was a side effect of compassion for the homeless. I wracked my brain for a solution. I had an idea, and I had an extra garbage can. 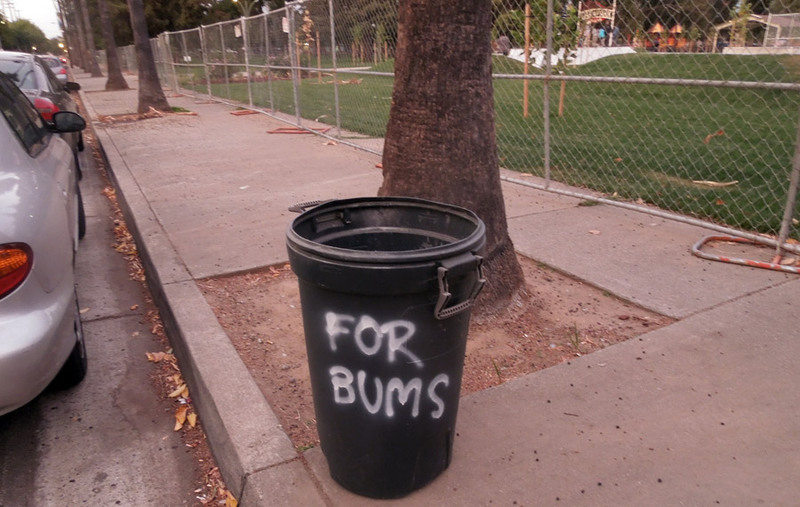 After scouting for an ideal location, I brought my own garbage container and marked it with spray paint: "For Bums". Bingo! Although the wording was a not ideal, I hoped that this new garbage can would provide a place for skaters to drop their empties. I had planned to use a cable and ferrule to attach it permenantly to a tree, so I also arrived with a pair of bolt cutters. Unfortunately I lost my nerve when I realized the park was blanketed with new video surveillance equipment. I rolled the can into place and walked hastily back to my car. This was its home. This new can wasn't aligned with the official garbage collection scheme, so it had a chance of taking root. I absolutely wasn't sure if it would stay or if it would be removed, ignored or stolen, but I was extremely hopeful that it could be the missing piece that this park needed to stay tidy. Eight weeks later, I got word from Amy. 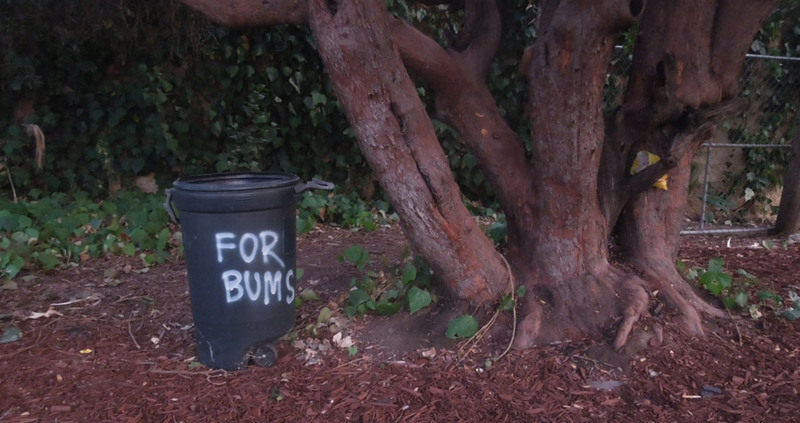 The "for bums" can was still there! Success! I haven't been keeping a close eye on the beer can situation, but I can't help but think that the For Bums can was at least part of a solution. How Much is Inside an Aluminum Can?